Let us begin by asking the obvious, what is BARZEL and how did you choose the name? BARZEL is an Industrial/Power-Electronics project that I began in order to fill a gaping void in the genre. I have been recording and working within various forms of experimental and extreme music for several years. I have always enjoyed the Industrial/Power-Electronics genre. It does however have its share of groups whose politics are questionable to say the least. There are a number of individuals who use neo-nazi/fascist imagery; some in an infantile desire to “shock” people, others seemingly out of a sincere racialist agenda. There are also groups representing various religious/ethnic identities, even Orthodox Christianity. I wanted to hear something that had the power of the genre accompanied by an ideology that spoke to me and addressed my concerns as a Jew and a Zionist. None existed until BARZEL. I basically created what I wanted to hear. I chose the name BARZEL, which as you know means “Iron” in Hebrew, because it fit the sound and aesthetic of the project. It is also very reflective of and implicitly connected with principles of the Betar movement, something very important to me. I'm a great admirer of Vladimir Ze'ev Jabotinsky. He is a hero of mine. Is Barzel a group? How many members does Barzel have and where are they from? BARZEL is a small collective that may include others from time to time but centers around myself. It is based in New York State . For our readers that are not familiar with it, how would you define and/or describe Industrial? Industrial/Power-Electronics is a fairly “underground” and somewhat obscure genre. It's generally comprised of harsh sounds and rhythmic elements, usually avoiding conventional structures and utilizing relatively unconventional sound sources (i.e. not based around guitars, drums and the usual instruments). The vocals are typically aggressive and harsh and vocal/spoken samples are sometimes used to fortify the message. The genre often seems to lend itself to the expression of relatively fringe politics and ideas, as well as being pretty aggressive and at times militaristic sounding. That said, there are a wide variety of sounds and approaches by different artists. Assuming that many Industrial fans are younger, can you explain your choice to emphasize ideas from Jabotinsky and Uri Zvi Greenberg in your work, when most young people are totally unfamiliar with them? The ideology we wished to express was never in doubt. It's the driving purpose behind BARZEL. I felt there needed to be a distinctly Jewish ideology and aesthetic represented in the genre to both counter the base elements I spoke of earlier, as well as to offer an alternative to them for young Jews who enjoy this kind of material but have nothing within the genre that they can identify with. As for Jabotinsky and Greenberg- every Jew, young and old, should know about these great men and, doing so, should hold them in the highest esteem. It is all-too-common to see young Jews look to others, especially those with a greater voice in popular/youth culture, for their heroes, when in fact there are plenty of heroes in their own culture who reflect their heritage. Much of the problem is of course due to a lack of proper education about Judaism. I'm a teacher, and even when Judaism is addressed in the public school system it's focused almost exclusively on the Holocaust. Of course this tragic chapter of our history must be taught and never forgotten, no one disputes that. I feel, however, that people need to know that we existed before the Holocaust and our story continues after it. It is a part of our history, not our history. We are eternal. So when I taught a Holocaust unit in an inner-city Middle School recently I spent a good amount of time teaching about the Warsaw Ghetto Uprising and the wider Jewish Resistance- the incredible stories of heroism and bravery. These men and women were the absolute epitome of courage. And there is no excuse for Jewish children, of all people, not to be taught about and have knowledge of the great men who fought for the rebirth to the Jewish state. My hope is that people such as you at SaveIsrael.com and myself, through BARZEL, will help revive interest in and reverence for these great figures. Jewish pride and Jewish knowledge are essential. Was Barzel produced for American audiences or Israeli audiences? 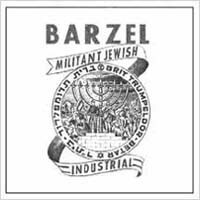 BARZEL was produced for those in Israel and the Diaspora. It's a strike against our enemies and a call-to-arms for our brethren and allies. Topheth Prophet, a great label based in Israel, released the first CD and will be putting out the second as well. It seems only fitting for it to be released on an Israeli label. How would you describe the response to your first album? What have sales been like? How have reviewers responded to the album? Excellent! The response has been overwhelmingly positive, Even those who have reviewed it and are perhaps at the most ambivalent toward the politics have given it great reviews. I just completed some interviews with European magazines that cover this type of music and most people have been very kind in their praise. But I am on a mission and will continue regardless of anyone's thoughts or feelings. If they like it that's great, if not that's fine as well. A funny thing was one reviewer called the CD “the second coming” of Power-Electronics, which was a great compliment but a funny way of stating it with the obvious Christian overtones of that phrase in reference to a work devoted entirely to Zionist ideology (laughter)…. We understand that you are planning to release a second album at the end of 2005. What should listeners expect? I expect the second CD to be released sometime in 2005. We are currently working on material for it. Listeners can expect more of what they heard on “A Shield of Defense and the Word of the Son of Blood” -a continuation and evolution of those themes and ideas. We will keep BARZEL pure and true to its intent. Hopefully there will be a performance in Israel to coincide with the CD's release. There is a lot of material related to the Jabotinsky Movement and Betar in your music, are you a Betari? No, unfortunately. I attended public schools and there was no Betar chapter in the area I lived in. However, I am very much aligned with their message and philosophy and fully embrace it. In your dedication you mention the Irgun and the Haganah but not the Lechi (Sternists) any significance to the decision? Not at all. The Lechi were a very important organization as well and I have nothing but respect for it and admiration for its actions. There were several people and groups that were omitted but not in any way due to a lack of respect. I focused on the people and groups I was channeling, so to speak, or thinking of during the creation of the CD. Ha-Shomer is another group I might have included. What do you think of the current political situation in Israel ? How much time do you have? I am appalled at the international media and its attitudes toward Israel . The rhetoric concerning the so-called “apartheid wall” is a prime example of this. People on the left and the legion critics of Israel are seemingly more outraged that Palestinians have to wait at checkpoints and are separated from the Jews by a wall (as if they were being deprived, as people actually were in South Africa, of the opportunity to live peaceably among their neighbors) than with innocent civilians in Israel being purposefully targeted and killed. The world's moral compass is considerably skewed, wouldn't you say? It is utterly disgraceful that a sovereign, democratic nation must constantly defend its actions against incessant and cowardly attacks by murderous terrorists. I also find disgraceful and intolerable the words and deeds of the left in Israel- especially during a time of perpetual war such as the country has endured these past several years. Such people are guilty of treason in my eyes and should be dealt with accordingly. Israel is pressured, both overtly and covertly, to make concession after concession (while some are made willingly as a gesture of good faith toward their so-called “peace partners,” seemingly soon to be led by Abu Mazen, a Holocaust denier no less) while the response is only more attacks. The totalitarian Arab regimes that surround Israel cannot stand the fact that the Jewish state even possesses the less than 1% of the land in the Middle East that they do. Of course there is nothing they can do about it, as Israel will always survive and is protected by a greater power than any on this earth. I do believe it must maintain a strong hand and that Judea and Samaria are and always must be a part of a Greater Israel and inhabited by Jews. Are you happy with the job that Ariel Sharon has done? I have defended him in the past. I have mixed feelings at the moment. He is in a rather difficult position, between his Likud constituency and those he must seemingly compromise with in order to achieve anything at all in a coalition government, and has had to make some tough choices. The debate is over the value of what it is he seeks to achieve. Giving up land is inadvisable, even more so when there are absolutely no sincere measures being taken by the other side. It's really a case of the “emperor's new clothes,” if you will. The world behaves as if both parties are equally committed to peace when only one party makes any real gestures toward it. It will be quite interesting to see how the Europeans and others who make demands of Israel to show restraint and to compromise with terrorist groups deal with the Islamic fascism that they are now beginning to face. Will they show the same restraint and “understanding” they ask Israel to demonstrate? If the Dutch reaction to the murder of a single man, filmmaker Theo Van Gogh, is any indication the answer is a resounding “No”. I laugh at the constant attempts by Tony Blair to suggest that the problem of terrorism can only be solved by the establishment of a Palestinian state. What then was the excuse for the unrelenting terrorism against Israel before 1967 and against the Jewish population before 1948? It's quite simply a red herring. And I'd like someone to tell me when there has before been such an effort to force a country to relinquish control of land that was acquired in a war of defense? Again, Sharon certainly has his work cut out for him. I'm not sure who the best viable option is. Realistically, I think he's the farthest right-leaning candidate who could maintain a coalition government at this time. I wouldn't mind being proven wrong about this, however. The settlers are going to be vigilant- they and their supporters seem to be the only ones in Israel concerned with what Torah says. It is a complicated situation and a crossroads of sorts. All Jews and other righteous peoples should support Israel . I will say that the Palestinians and the rest of those who think Sharon is so incredibly hard and unyielding should consider themselves lucky I'm not Prime Minister. How do you relate to such ancient history as the Macabees, Bar-Kochba, and Masada ? Why do you think such things should matter to Jews today? That's our heritage. It's in our blood and a source of great pride to me. The people you mention are our heroes. Some Jews today have lost sight of who they are and where they came from and it's adversely affecting where we are going as a people. We are such a vast minority everywhere but in Israel that we must be vocal about our Judaism and any concerns we have about affairs both in Israel and the Diaspora. Ultimately every Jew is responsible for every other. Do you have any other comments that you'd like to share with our readers? A quote from Rav Kook: ”The purely righteous do not complain about evil, rather they add justice. They do not complain about heresy, rather they add faith. They do not complain about ignorance, rather they add wisdom.” Thank you for the great work SaveIsrael.com is doing in keeping our history alive and in educating people. Thank you as well for your interest in BARZEL. Anyone wishing to contact me may do so at: XBarzelx@aol.com . Ahavat Yisroel!